Recycling your auto shop’s waste antifreeze can save you money. That headline alone should be sufficient to get your attention. Garage owners are constantly looking for new revenue streams and ways to cut spending. This is a realistic and viable way to do both. Most shops currently pay someone for the service of disposing of their waste antifreeze. this costs a significant amount of money. Now you don’t have to dispose of it anymore. ASEdeals.com now has two different antifreeze recycling units to allow you to recycle your waste antifreeze. Antifreeze can be recycled to like new condition through various filtering and osmosis processes and by adding a few additives you have a perfectly good product. So not only will you save money by not having to unload all of your waste antifreeze, you also won’t have to purchase nearly as much new antifreeze. It’s a win / win situation for any shop owner. We have machines that recycle in batches from 25 to 50 gallons, and we have units that hook directly up to the vehicle to recycle each vehicle’s antifreeze individually. Our batch recyclers are manufactured by KleenTec and our vehicle recycler is made by Viper. Both are highly respected names in the industry. Visit our web site or give us a call for more details. We carry several different Car Lift manufacturers. Forward, Challenger, Dannmar and BendPak. The best lifts by far are our BendPak Two Post Lifts for many reasons. One of those reasons is the triple telescoping arms. Another reason is that they are ALI certified. Yet another reason is the variety of options available for them. For instance, the pads that touch the vehicle frame. BendPak Lifts come standard with a rectangular steel pad with a rubber slip-on pad over it. The rubber is there to protect the vehicle from scratches underneath to avoid potential for corrosion. The rubber slip-on pad is replaceable. BendPak also offers other options. They offer a steel lift pad option. This steel lift pad is a round pad that is concave and cupped like a traditional floor jack saddle. These steel lift pads are popular with customers who want a pad that won’t allow slippage when lifting a surface that is rounded, (like an axle). Then they have a Frame Cradle Adapter Pad. The frame cradle adapter pad is a rectangular pad that is bent up at a 90 degree angle on two sides. The purpose of this style is similar to the steel lift pad. The frame cradle adapter also has a rubber pad in the center to protect the vehicle underside. Finally, they offer a screw pad adapter kit. This has infinitely adjustable height adapters for those customers who prefer precision when it comes to the height of the adapter. Our most popular lift with the home / hobbyists out there is a BendPak Lift. It’s the BendPak model HD9 and HD9ST four post lift. But they’re not just for the home / hobby crowd. We also sell many to commercial shops as well because these are no ordinary car lifts. They are ALI certified lifts. They are suitable for commercial use. 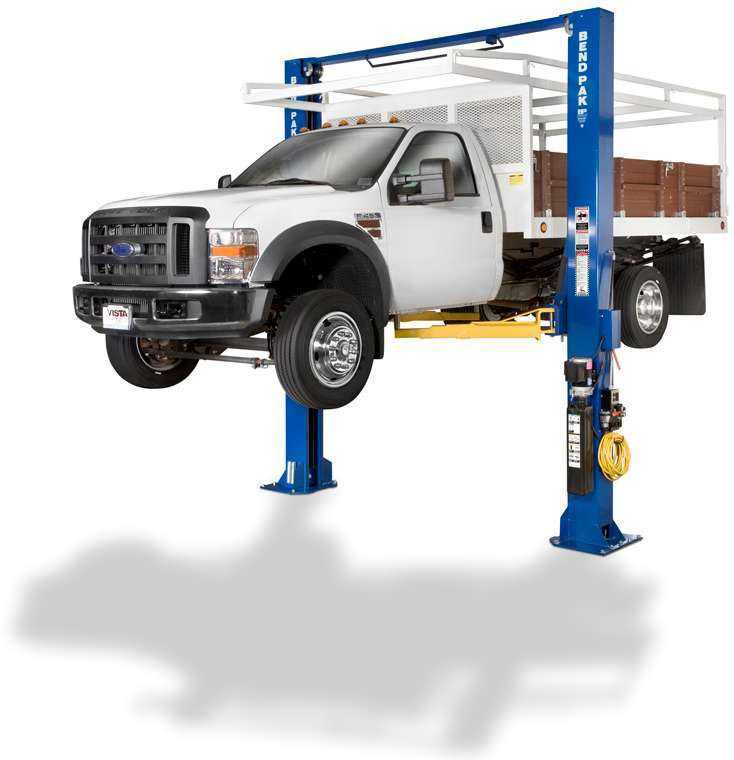 But the primary customer for this lift is the gearhead and the guys who just want to add some storage space to their garage . You know who you are. You’ve got too many toys and not enough parking space in your garage. No problem. That’s what this lift is all about. Case in point: Robert Shock from SuperTan in Strongsville, OH. He sent us some pictures of his HD9 lift in his garage, along with a little comment.”I couldn’t be any more satisfied. I am very happy with the Four Post Lift I purchased as well as the Two Post Lift I bought back in 3/2009. I Love the car lifts and your service”. We should all have such a beautiful garage and such a great selection of automobiles. So many customers are finding out why the BendPak HD9 lift is the lift of choice for the discriminating car enthusiast. Call us with any questions at 800-229-6218. There are many different types of air compressors on the market these days, as well as many different manufacturers. Given the wide array of choices, your first task is to determine what type of compressor you need for your specific application. Maybe you need a gas powered compressor or electric Air Compressor ? When outfitting a typical auto shop, where the compressor is going to have access to electricity, then the decision is simple. You will need an electric air compressor. Obviously, if you are going to be using this away from a power source, out in the field, or on a service vehicle, then you will need a gas powered air compressor. The next task is to determine what size compressor you need. To determine this, you first need to find out what the air requirement will be for the tools you will be powering with this compressor. First, check out the CFM (cubic feet per minute) requirements of each and every tool you will be powering with your compressor. You can usually locate this information in the owner’s manual for the tool. Sometimes it can state this information right on the tool itself. It should tell you how many CFM’s the tool requires and at what PSI the CFM is required to be at. You should then get an air compressor that puts out a little more air than your tool’s air requirements are. Be aware that if you are going to be operating more than one tool at a time, as you typically would in a multi-bay auto shop, you will need to add up the air requirements together of all those tools that you might potentially be operating at the same time. Most typical three bay auto shops for instance, will usually get a 5 HP to 7.5 HP air compressor. This is our most popular size range that meets the typical auto shop’s needs. Most compressors in this size range will supply between 15 CFM at 100 psi to 28 CFM at 100 PSI with a maximum psi of 175. Although there are many smaller and larger models ranging from 2 HP even all the way up to industrial air compressors up to 40 HP and more. You can view more in-depth details about air compressors on our web site. Check out the many different choices on our web site and get back to us with any questions. Customers frequently ask us, ” How do I know where to place the lift pads of my Two Post Lifts underneath my vehicle? Where are the best jacking points? Where are the safest jacking points”? Most commercial auto shop technicians already know where to place the lift jacking pads. But we get many customers who are not quite as familiar with working with a two post lift, even home hobbyists who purchase this type of lift. These customers don’t always have the necessary experience with this type of application. Generally, most vehicles have their main jacking points on the sides of the vehicle right behind the front wheel and just in front of the rear wheel. But this is not always the case. Even when it is, sometimes it can be difficult to determine where they are. Some manufacturers provide literature along with the purchase of a lift that will guide you on lift safety practices and illustrates the safe vehicle jacking points. BendPak is one manufacturer that we carry that provides such literature. They are one of the premier manufacturers in the Car Lift industry and have been manufacturing lifts for decades. We have been carrying them for over 10 years and are very please with the feedback we get on them. ALI (Automotive Lift Institute) also distributes literature on two post lift safety practices. BendPak provides this ALI literature with every ALI Certified lift. The rapidly growing popularity over the past several years of the low profile tires and run flat tires has brought about a rush of new tire changers to handle them safely, and with out damaging the expensive alloy rims that they are mounted to. If you don’t want to turn away paying customers, you had better get a tire machine that can handle these wheels. Shop owners are always looking for new ways to gain extra revenue. One quick, easy and fairly affordable way to do this is to start offering this service. There is a wide variety of tire changers that are made to handle low profile tires out there. There are many economy brands out there and some of them can be reliable and a good value. There are also many high-end manufacturers out there who make top-of-the-line machines that have all the bells and whistles you can possibly have, but are out of range of the budget of most shops. We carry both. But for quality and affordability, the machines we recommend the most, and sell most, is our Ranger tire changers. Ranger is a great manufacturer that we have been carrying for over 14 years now. They are a division of BendPak, one of the largest lift manufacturers out there. They have been around for over 40 years. Ranger Tire Changers are reliable, affordable, and a significant step up from the bargain brand machines out there. One of the things that differentiates Ranger tire changers from the bargain brands is the fact that they have a one year warranty that offers on-site service as part of the warranty. Another complaint about the bargain brands out there is that you can’t get parts, or that they are difficult to obtain. No such problem exists when you purchase a Ranger Tire Changer.They maintain a steady supply of parts, even for old, discontinued models. Ranger has a wide variety of tire changers to fit almost any shop’s needs. We will cover several of these models in future posts, so stay tuned. There is no disputing that a top name in the welding industry is Lincoln Electric. These guys are one of the premier names in the industry. They were actually founded in the 19th century. How many companies can claim that? And the beauty of it is that they still manufacture many items here in the USA. This is getting more and more scarce these days. They have state of the art manufacturing facilities and are one of the most reliable and innovative manufacturers that we carry. They also have service centers nationwide. A comforting thought to customers who have grown used to the unfortunate rise of the modern “throw-away” mentality of most companies today. You may also be interested to know that they even have some welding robots strategically placed in the new Iron Man 2 Movie. While we don’t carry any welding robots, we do carry a wide variety of their Mig Welders. They have models ranging from small, lightweight 115 amp wire feed models for light duty work, all the way up to the heavy duty 255 amp model for thicker material. You can weld aluminum with the optional spool gun and with all the models packed with features, there’s virtually no job that you won’t be able to handle. We will cover more details in future posts about specific models and their features, so keep an eye out. Many Golf course and other lawn and turf maintenance facilities now have a two post lift by BendPak for turf equipment. The new XPR-7TR Turf Equipment Lift is the latest edition to the BendPak Lift line-up. Customers have been asking for this type of lift for some time, and BendPak has now delivered. It is built off the frame of the popular XPR-10CX Two Post Lift. This is their 10,000 lb capacity symmetric extra wide lift. They replaced the arms with specialized turf equipment arms. As a turf equipment lift, it is rated at 7,000 lbs. Now you can lift lawn tractors, golf carts, and all other kinds of turf equipment. We’ve had many customers ask if they could also get the regular automotive arms for the lift so they could also service automobiles. Guess what? – You Can! So now you have two lifts in one. Just change out the arms. Additional charges will apply for the automotive arms. And of course, you’ve got the great BendPak warranty and product support that they’ve become known for. Call us at 800-229-6218 for more details. There are so many choices. How do I choose? This is the question we get every single day here at ASEdeals.com. Customers are inundated with choices and without the proper schooling, you could be throwing your money away. How powerful a unit do I need? How large do I want it to be? What is the quality of the unit? Lets start with the first question. You want to get a jump starter that will get the job it was intended for. If it can’t start the vehicle, then what good is it? The rule of thumb is to get a battery jump starter that has at least as many cranking amps as the battery of the vehicle you are jumping. You may not always need that many amps, because many times the battery of the vehicle you are starting is helping even if it doesn’t have enough power to start the vehicle on it’s own. Next, the size of the Jump Starters can be important to many customers. They want as much power as they need in as small a package as possible. You may need to fit it in a small box, or in the trunk of your car. You don’t want something taking up a lot of space. Price is always a consideration. You want to get the job done, but you don’t want to break the bank. Many jumpstarters come with lights, radios and all kinds of accessories that can distract from the main point of the equipment, which is to start your car. Many of these models on the market out there are short on power, and long on bells and whistles. Quality is vital. Most models on the market today sacrifice quality for the sake of price. The engineering and design of the battery, the key component in a battery booster pack should not be a secondary consideration. Many manufacturers are using an inferior battery that will not have the power, reliability, and life span that you need. We carry a variety of manufacturers when it comes to car battery jump starters. They are all of a commercial quality, not a consumer quality. This means heavy duty cases that won’t fall apart in a bunch of pieces if you drop it. Thick gauge cables and high amperage clamps. Most importantly, they utilize the best technology for the battery, the lifeblood for any jump start unit. Plus, they have the best warranty in the industry. We will get into specific options in future posts so keep an eye out for them. Give us a call at 800-229-6218, and we’ll fit you with a jumps starter that’s right for you. There are a plethora of choices on the market these days when it comes to choosing an Automotive Lift. Two post lifts, four post lifts, scissor lifts, low rise lifts, mid rise lifts, pit lifts, mobile column lifts, alignment lifts and more. This article is not going to touch on the different types of lifts. It is going to describe the three different manufacturers that we currently carry. Top of the list is our BendPak Lifts. BendPak is one of the premier car lift manufacturers in the industry with over 40 years in the business. Most of their two post lifts and four post lifts are ALI Certified. ALI is the Automotive Lift Institute. They are the recognized authority on lift quality and safety standards. BendPak Lifts are top-of-the-line all the way. They have the best features, the best warranty, the best quality components. Features such as dual safeties on their four post lifts and triple telescoping arms on most of their two post lifts are what set them apart from other manufacturers. 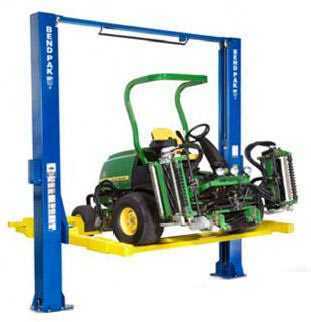 We also carry Dannmar two post lifts and four post lifts. We have been carrying them for about eight years now and are very pleased with the feedback on them. They hold up well over time and parts are readily available. The best way to describe the Dannmar Lifts would be to designate them a good quality mid-grade lift. Not top-of-the-line, not economy lift, but mid grade. Next, we carry Tuxedo Lifts. These lifts are also another good mid-grade manufacturer. Although they do have a couple of economy models for those customers who are on a budget, but want a good, reliable auto lift. They also even have one two post lift model that is ALI Certified. They have a wide selection of models, including 8 two post lifts, over a dozen four post lifts and even a scissor alignment lift. While the quality may vary on these lifts, they all have one thing in common. They are all reliable, durable lifts by quality manufacturers and we have been carrying them all for over 7 years, which means they are not some fly-by-night outfit that will disappear the days after your purchase. You are currently browsing the Car Lift Blog blog archives for May, 2010.